Recently while working on a retractable skeg design I was searching for clearer reasons a skeg was a valuable addition to a kayak. I found the following explanation which made more sense than the low pressure on the upwind side argument, but probably amounts to the same thing. A Greenland kayak has a fine stem and deep foot which is planted in the oncoming water as the kayak is paddled forward. The stern stem is unweighted, so a beam wind can blow it downwind causing the kayak to weathercock. And the bigger the waves the more the Greenland bow digs in. Now the Greenlander, as a solo hunter sneaking up on seals sleeping on ice flows, the deep bow stem would keep a kayak tracking straight after you stop paddling, exactly what a hunter poised with a spear, would want. And once you have the prey and work to bring it on board, if you encountered windy conditions you kayak will weathercock and not blow uncontrollably downwind. 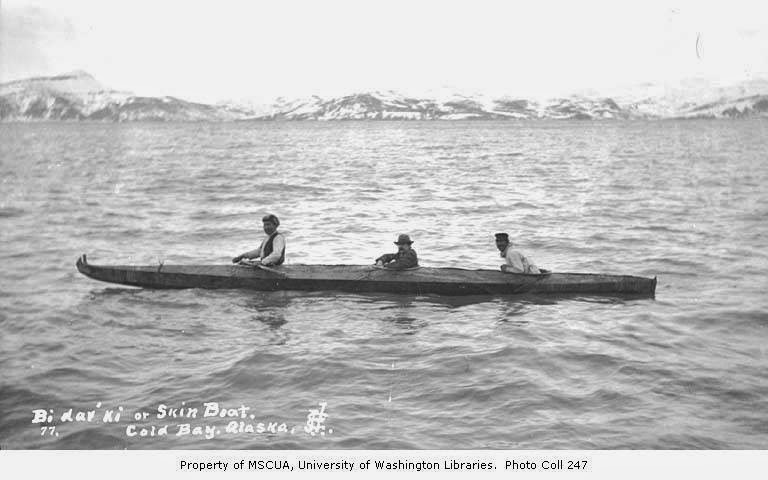 Now the Aleut (Unangan) baidarka is a very different design for very different seas conditions and hunting methods. The bow stem has no deep foot but, has an edge from the bow tip curving right into the keel in an unbroken line of rocker for almost 30% of the kayak length. It has a fine entry but, the volume and immediate flare does not allow it to plant the stem in the wave as happens with the Greenland kayak. The volume and flare of the baidarka bow also rises high with waves. further reducing the planting effect the Greenland kayak suffers from, which causes weathercocking. The voluminous stern of the baidarka with the fixed rudder balances out the kayak to be much less effected by beam winds and reduces weathercocking almost entirely. I've been paddling my Aleut style stripper baidarkas since 1993 and in that time I have noticed, while paddling with Greenland based designs, instances where these kayaks required use of a rudder to stay on course in a beam wind, where I did not. Another sea condition which points out the differences in Aleut and Greenland designs are with a following sea. In certain sea conditions, of just the right wave height and frequency, when you are running with the waves, you may experience a Greenland kayak starting to broach (turn sideways parallel to waves) with every wave crest hitting the stern. It can be tiring and no fun, to constantly need correction strokes to stay on course. Here again, the Greenland kayak bow is planted in the slow water of the wave trough, while the stern is pushed aside by the faster moving wave crest. The Aleut kayak, with the high volume bow, with flare, and no deep stem foot to plant in the slow trough, is easily controlled in following seas and naturally turns into a surf board as breaking wave crests push on the scalloped stern surfaces. 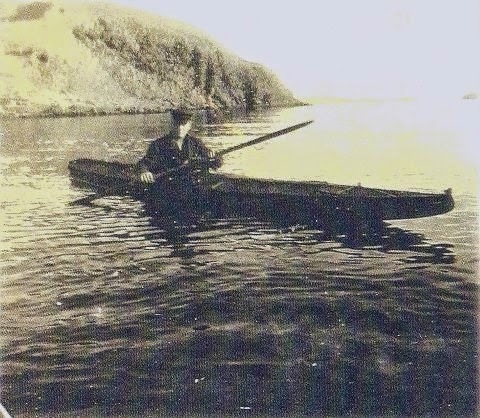 Obviously, the Aleuts knew their seas and knew how to design a kayak to take advantage of their rough waters, their need for speed to chase down prey, and to surf the waves home, achieving speeds to confound European sailers. These are my conclusions after twenty years of paddling an Aleut inspired kayak design.